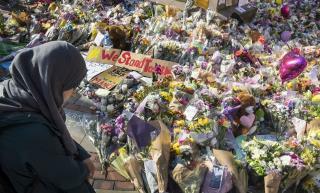 (Newser) – The suspect in the deadly Manchester concert bombing was driven by what he saw as unjust treatment of Arabs in Britain, a relative said Thursday, confirming he made a final phone call in which he pleaded: "Forgive me." Salman Abedi was particularly upset by the killing last year of a Muslim friend whose death he believed went unnoticed by "infidels" in the UK, the relative told the AP. "Why was there no outrage for the killing of an Arab and a Muslim in such a cruel way?" she asked. "Rage was the main reason," for the blast that killed 22 at the end of an Ariana Grande concert at Manchester Arena on Monday, she said, speaking by telephone from Libya. It seems pretty obvious from the AP article that he was asking forgiveness from his family for all the problems he was causing them, not from any "infidels". He probably thought we're all going to hell anyway. Salman Abedi was reportedly upset over killing of Muslim friend in 2016" Yeah, yeah.....he was probably crying too when the US killed the UK's "Jihadi John."